REVIEW: Dan Ouellette on Judi Silvano’s Recent Appearance at Birdland! 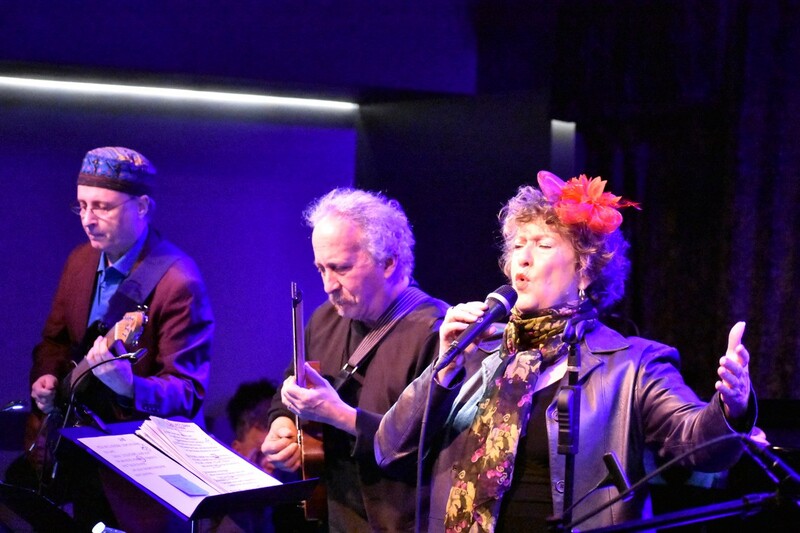 Judging from vocalist Judi Silvano’s latest album, Lessons Learned on Unit Records, her sold-out Birdland Theater date on February 18 with the all-star Zephyr Band promised to be an off-center affair for a jazz club. The recording doesn’t drive straight up the standards middle of the road. First off, Silvano penned all the ten tunes with a joyfully eccentric personal touch on life and love with wonder, humor, wisdom, self-doubt and honesty all part of the equation. Yes, the title of the album sums up the subject matter. But it doesn’t prepare you for the breadth of music Silvano and her team deliver — a rich mix of her well-respected jazz undergirding inflected with charged rock energy, r&b-flavored groove and avant improvisation. Then there’s the instrumentation that creates a surprising freshness of spirit and color. Two guitarists — Kenny Wessel, Bruce Arnold — don’t just trade off each other. They intertwine with orchestral glee, with the latter interspersing processed effects into the mix. Lessons Learned was produced by Silvano’s husband, Joe Lovano, who adds his robust tenor saxophone flair on a couple of tunes in addition to overseeing the collective sharing that’s at the heart of the recording. The band also features Adam Kolker (bass clarinet, saxophones), bassist Ratzo B. Harris, drummer Bob Meyer and percussionist Todd Isler. There was a palpable sense of anticipation in the crowd at Birdland Theater (the intimate new space that frankly upstages the club setting upstairs) as the show time approached with all-star drummer Matt Wilson guesting. Silvano opened the show with a mellifluous beauty, “You Will Know,” where she warmed up the room with a pitch-perfect voice and introduced the guitar duo interplay. It was a captivating moment that led to the life-affirming “Round and Round” that celebrates the miraculous quality of life. With a healthy respect for the aging process we all experience, she wondrously sang “Every day is a gift” which Wilson punctuated with skipping rimshots. Silvano led the band into a groove with the rhythmic song of uncertainty, “Dark Things,” with Kolker shading the story with a dark bass clarinet line, after which she explained how the music was written over the course of the last five to eight years fueled from touring in different places of the world. Particularly inspiring, she said, was a castle in Budapest that got her thinking of an expansive world view. “Castle Song” marked a pensive, thoughtful moment that dramatically changed in the next song, “Riding a Zephyr,” one of the highlights of the show. Silvano introduced Lovano who opened the piece with tenor gusto while Wilson was crashing the drums and playing a simpatico rhythmic charge with Harris. Silvano turned the song into a muse but with a muscular underpinning as she sang of gentle breezes and shades of blue, scatted and danced to the sweet groove. The band responded, especially Wessel and Arnold who powered through with rock-tinged beauty. The piece took the audience into a whole new universe that Silvano brilliantly opened. Silvano sang with heartfelt beauty on “Hand and Heart,” her love song to her husband, followed by another personal tune, “After Love,” where her smooth vocals embraced the midtempo melody. So self-assured and comfortable, you could even hear a trace of sass in her voice. Ample support came from Kolker on bass clarinet, Wilson cooking the rhythms with Harris and the guitarists providing the orchestration. More upbeat music came next with the hip cooker “Shuffle and Sway,” with a catchy blues-blissed line and rock flair. Guest Dr. Dan Silverman blew a riveting trombone solo. Lovano returned for the most adventurous tune in the set, “Dust,” with an avant improvisational feel that caught a groove with Silvano’s vocal ecstasy duetting with the tenor saxophonist’s free flow of notes. It was adventure music. Silvano ended the show with a pop song of sorts, ”The Music in My Body,” with Wilson rocking out. The encore, dedicated to her sister in the house, was an animated, lively calypso tune delivered with verve. Might as well leave the stage dancing. The most remarkable takeaway from Silvano and co.’s exceptional 110-minute show was its joyous celebration of the art of making music without conceit. It was a well-rehearsed team affair, a playground of respect, gratitude and surprises.